Parnell Rose Garden also goes with the alias name Dove-Myer Robinson Park with a beautiful rose garden nestled within it. The park is particularly known for its roses that are exceptionally taken care of by many international rose breeders. Named after Dove Myer, the longest running mayor, Parnell rose garden is home to a variety of flowers particularly roses that are found in all colors and breeds here. 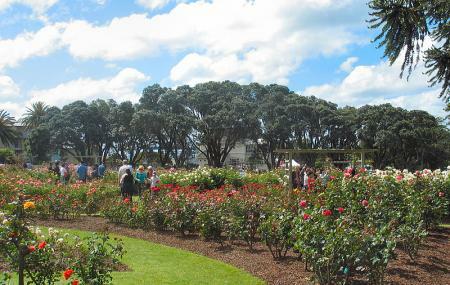 Every year, in November, the park hosts a festival- Parnell Festival of Roses that is known for drawing a lot of visitors. People coming here can see the various exhibitions, music, performances and what not. Apart from its garden, the park is also home to some other incredible attractions including ‘White Garden’- the ultimate wedding place in the city and the oldest Manuka and the largest Pohutukawa tree in Auckland. To enjoy the spectacular blooms at their fullest, visit the rose gardens between October and April. Pedestrian access is available 24/7. For other timings, visit the official website. How popular is Parnell Rose Garden? People normally club together Auckland Botanic Gardens and Silo Park while planning their visit to Parnell Rose Garden. Lovely garden with so much variety of roses. Came here for an all day workshop. The location was quite nice being next to the rose garden and the park. Parking wasn't too difficult to find. The place itself was fairly spacious and clean. The food they provided was quite nice. They also changed the water bottles on the table regularly so it was always cool, which was really nice in summer. The only issue I had was the lack of air conditioning since the place did get quite hot especially when the sun was shining through the large windows. Nice gardens and walks. Parking and toilets also available. You can also walk down to the water. It is both pram or wheelchair accessible. Recommend you go in Spring or Summer when the roses bloom as it is a bit bare in Winter though there are other things to see.